Khadija Ismayilova is the recipient of the 2015 PEN/Barbara Goldsmith Freedom to Write Award. 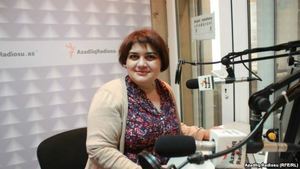 An Azerbaijani journalist at Radio Free Europe/Radio Liberty (RFE/RL), she has gained international acclaim for her hard-hitting investigative reporting on official corruption. After a years-long government campaign against her, Khadija was arrested on December 5, 2014, on spurious charges of inciting a former colleague to suicide—a charge she vehemently rejects. She remains in pre-trial detention, which has been twice extended through May 24, 2015. I have not been allowed to see my family, either. The arbitrariness of the penitentiary system allows me two phone calls each week that I use to speak with my mother but, contrary to the law, denies her and my lawyer regular visits. I have access to very little information. At least I have books to keep me company. I am translating one of these—Children of the Jacaranda Tree by Sahar Delijani—a novel about history and memory that is woven around the interlocking stories of three women imprisoned in Iran, and the people who support and are supported by them. But what about the real crimes—the theft, the contempt for the law? What pushes people to commit these crimes? We also constantly ask ourselves where are we going, and what will we get in the end? In Kurdakhani prison, where I am now, the usual answer is three to five or five to twelve years in jail. But my answer is that there is no end. The fight between good and evil goes on, and the most important thing is that this fight should not end. If we can continue to reject the thinking that is imposed on us and believe that human dignity is not for sale, then we are the winners, and they, our jailers both inside and outside prison, are the losers. Prison is not frightening for those trying to right a twisted scale, or for those who are subject to threats for doing the right thing. We see clearly what we must fight for.